Early, warm springs, long, hot summers, and gentle, fall breezes equal more time for golf! We have several courses for you to choose from - each as distinct and attractive as the terrain they were built on. Come and play on the best of BC. Predator Ridge is rich in history and tradition. There are very few settings in North America as breathtaking as this one. Play your shot, then pause and take in your surroundings. The rolling hills and mountains of the north Okanagan unfold around you while granite outcroppings protect fairways and greens. The award-winning golf courses here offer two distinctly challenging yet playable layouts for golfers of all levels. Predator is one of the best courses in Canada, and Ridge features breathtaking views of Okanagan Lake. Predator Ridge has hosted the prestigious World Skins Game, featuring some of the best players in the world, twice. Legendary course architect, Les Furber, designed the course. Rolling hills, long grasses and undulating greens make this course an unforgettable golfing experience. 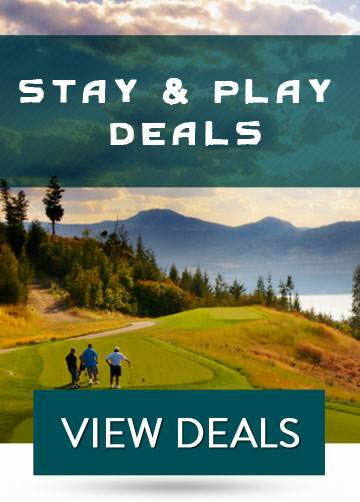 Improve your game at the Predator Ridge Golf Academy, headed up by former LPGA tour player AJ Eathorne and her select team of PGA of Canada professionals. This academy will provide you with a level of golf instruction unmatched in Canada. Check out their Swing Like a Girl clinics or sign up for some private instruction. Play a legendary round, or hone your skills at Predator Ridge and you'll discover why Hockey Canada chose this place as their summer home. Immerse yourself in the scenery at The Rise Golf Course; the only Fred Couples signature golf course in the Okanagan Valley. You'll be challenged by the course's fairways carved through rugged rock and pristine wetlands. Prepare to be distracted by the awesome lake views 400 metres (1300 ft.) below. Get out on this fast playing 18-hole golf course with short and challenging holes. Enjoy eight relaxing lakes connected by a wandering creek. Hillview Golf Course is no chip and putt as there are several sand traps that make this a target golf course where accuracy is the name of the game. The lush, green fairways here offer two distinct experiences, the 9-hole executive or the 18-hole championship course. At Spallumcheen Golf and Country Club there's plenty of water and sand challenges at every hole on this walkable, expansive golf course. The championship par 72 course has challenged golfers for over a century. At the Vernon Golf & Country Club, the towering Lombardi poplars and mature weeping willows stand guard in a beautiful parkland setting. The inside five at Vernon Golf & Country Club is known to have one of the strongest finishes in the Okanagan.